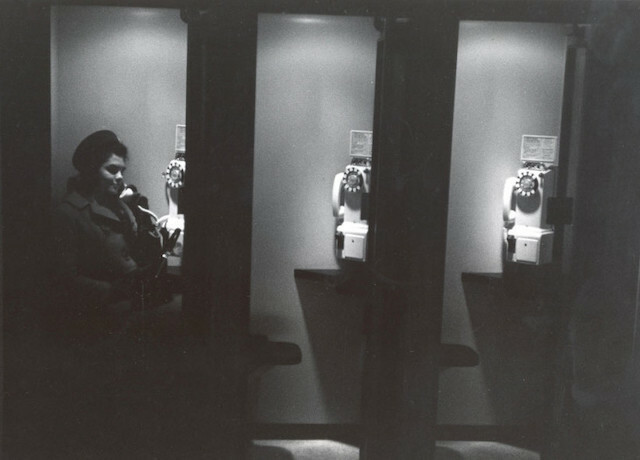 In 1960, pay phones — or Pay Stations — had 3 coin slots. Most of them were black but they also had them in green and beige. The handset cords were initially plastic like a regular phone. It wasn't until later in the 60s that they started using the armored cords to prevent vandalism. In 1952 the charge for a local call was changed from 5 cents to 10 cents. In Atlanta and most cities, pay phones worked on a Prepay basis. You had to deposit a coin before you could obtain a dial tone. This meant you couldn't place a free call or even an emergency call without depositing money. Outside of Atlanta, in smaller towns, pay phones worked on a Post Pay basis. With this arrangement, you got a dial tone first and dialed your number before depositing any money. You waited until the called party answered and then quickly deposited your dime. When placing a long distance call from a pay phone, you called the operator and gave her the information. Using the pre-pay service, the operator asked you for the initial deposit amount before connecting you. If your call was not completed, your deposit was returned. Using post-pay service in smaller towns, the operator told you the amount of the initial deposit but told you to wait until the called party answered before depositing anything. The operator had no way to return your money on a post pay phone. The Atlanta Airport had a lot of pay phones. Most of them were found in banks of wooden phone booths throughout the terminal. 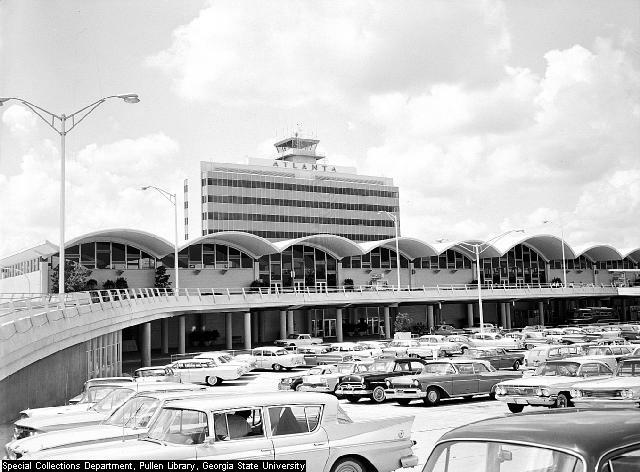 The central office that served the airport itself was the East Point Step-by-Step office. So most phone numbers in the airport area were "761", "766" or "767". But the airport pay phones had telephone numbers out of several different central offices. We assume this was to avoid putting all of the traffic into one office. Some had 523 numbers out of the Auburn Avenue Step office. Some were 688 numbers out of the 51 Ivy No. 5 Crossbar office. Some were 361 numbers out of the Forest Park No. 5 Crossbar. This made it possible as a teenager to go from one phone booth to another within the terminal and listen to the sounds of these different switching machines. Around this time, the major national television and radio networks in the U.S. relied on AT&T Long Lines to carry their network programming, live to affiliate TV and radio stations. The introduction of the Microwave Radio system in the 1950s created enough bandwidth to carry color television programming for the four major TV networks, along with thousands of simultaneous telephone calls. 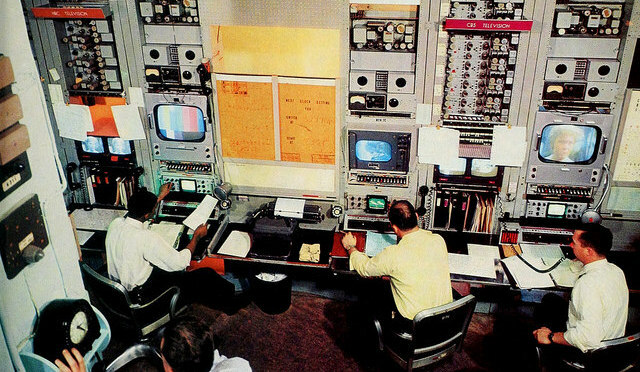 In the 51 Ivy building in Atlanta, AT&T engineers operated a control center like this one. They were responsible for monitoring the signal quality for each network and for setting up special signal feeds for events. Around 1964, another floor was added to the Buckhead central office building. A No. 5 Crossbar machine was installed and began service with the code "261". The existing Step-by-Step office serving "231", "233" and "237" remained in service. Around the same time, the Conyers Step-by-Step office with the code "483" was replaced with a No. 5 Crossbar. These two machines introduced a new type of ringing machine with a higher pitched ringback tone. In 1967, the "231" Buckhead customers were moved from the Step-by-Step to the No. 5 Crossbar and their numbers were changed to "261", keeping the same last 4 digits. The newspaper reported that around 1800 customers were changed. In the same year, the "266" code was added. 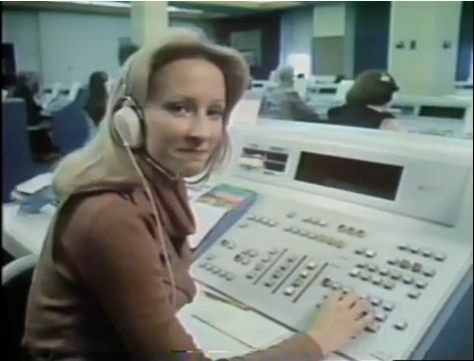 In 1966, Touch Tone Dialing was first introduced to Atlanta. 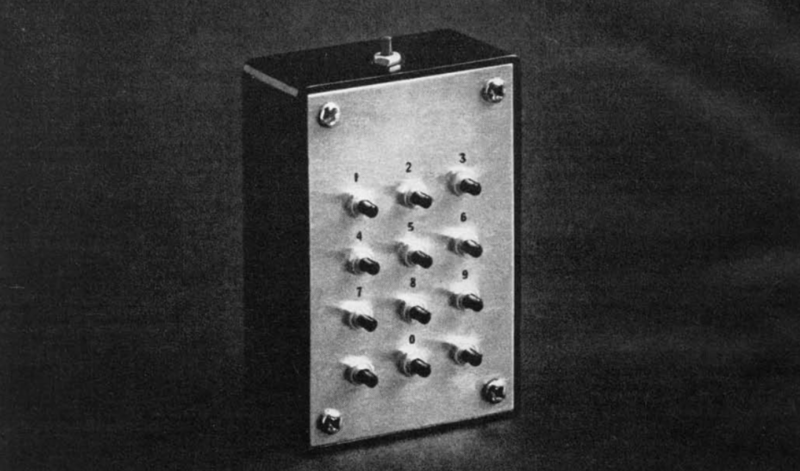 Touch Tone had been in trials in The Bell System since the 1950s and was first introduced commercially in other cities in the fourth quarter of 1963. The first Touch Tone telephones had 10 buttons. The * and # buttons were added a few years later. Atlanta's first Touch Tone service was quietly introduced to customers with "252" and "255" Sandy Springs numbers. There was no fanfare or advertising since it was only available to a small part of the city. Sandy Springs customers were probably notified about it through a pamphlet in their telephone bills. Touch Tone required new equipment to be installed in the central office. The telephone company wasn't sure about how many customers would be interested. The installation charge of about $15 and monthly fee of $1.50 per line was considered too expensive for many people. So the service was rolled out slowly in other central offices. The first offices to be equipped for Touch Tone were those with No. 5 Crossbar switching equipment, like Sandy Springs. Inside of the Atlanta Exchange area in 1966, there were just 8 of these offices. The central offices with step-by-step equipment would require more expensive equipment. So they were not equipped at first or at all. Some customers heard about Touch Tone service and wanted it as soon as they could get it. They may have seen it in someone else's home or business or may have seen it in another city. But when they called the Telephone Business Office to order it, they were often disappointed to find out that Touch Tone was not available in their central office. In a few areas served by offices with mixed Crossbar and Step-by-Step equipment, such as Downtown, customers were allowed to change their telephone number to switch to the Crossbar machine and get Touch-Tone. Another option that you could have used to get Touch Tone if you wanted it badly enough and your central office didn't have it was called "FCO" (Foreign Central Office). This means you have your telephone connected to a central office other than the one that normally serves your area. For example, if you lived in East Point and wanted Touch Tone, you could get a downtown telephone number. But you would have to pay a monthly surcharge plus a per-mile charge for the distance between downtown and East Point. This was rather expensive in 1966. Very few people opted to do this. But a few businesses did. A few Step-by-Step offices did eventually get Touch-Tone service. This was done by adding Touch Tone Converters, which received and recorded the digits dialed and sent out dial pulses to operate the Step equipment. It would take several seconds after dialing for the dial pulsing to finish. The Buckhead 233/237 office and the Decatur 373/377/378 office got Touch-Tone converters but most Step-by-Step offices did not. 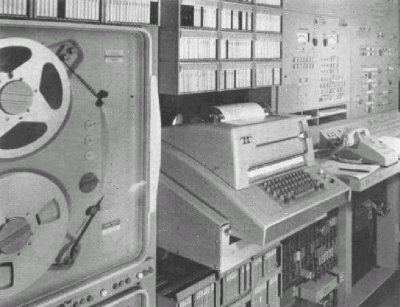 The Toco Hills 633/634/636 office, which served a large, mixed residential and business area in the northeast part of town, was an example of an office that never did get Touch Tone until the Step-by-Step equipment was eventually replaced in 1980. It is hard to image life without Touch Tone dialing. But in the 1960s, there were no automated voice response systems and hardly any computers. When Touch Tone service was added to a central office, the dial tone in the office was changed to the modern dial tone that we have today. This was referred to as "precise dial tone". The older dial tone supposedly interfered with the Touch Tone signals. In 1966, the codes for Information and Repair service were changed to 411 and 611. Prior to this they were 113 and 114. Soon after this, Directory Assistance operators stopped answering "Information!" and began to answer "Directory Assistance". At one point, operators were instructed to ask you if you had checked the directory first before they looked-up a number for you. At this point, Directory Assistance was free of charge. A few years later, customers began to be charged for calls to 411. For customers in Step-by-Step offices, that did not yet have automatic number identification, the operator would answer "Directory Assistance, Your Number Please?" This probably confused a lot of callers. The operator needed your number to key into the equipment so you would be charged for the call. Around this same time, the number "555-1212" was introduced to call directory assistance in another city. Prior to this service, you had to dial "0" and ask your operator for the information operator in the city you were calling. At first, these calls went to an operator on a cord switchboard in the primary city for the area code. The operator answered "Directory Assistance. What City, Please?" She then connected you with the information operator in the town you requested. In these days, Directory Assistance used paper directories to look up numbers. There were no computerized directories. Eventually, centralized Directory Assistance offices were established for each area code. Operators in these offices had complete directory listings for all places in their area code. This method made it possible to handle calls faster, but required centralized maintenance of directory listings. Computerized directories eventually simplified this process considerably. WATS was a service offered by the telephone company to businesses that placed frequent long distance calls. This involved the installation of a separate telephone line, known as a "WATS Line". These lines could be used only for long distance calls and not local calls. They were billed in hour increments, instead of per call and per minute increments. WATS service was based on a system of "Bands". Band 0 was for Intrastate service only. Interstate bands were numbered 1-5. The higher numbered bands reached further distance and were more expensive. You could not call within the state on an Interstate line. To call both Interstate and Intrastate, you had to buy two separate WATS lines. Large businesses typically had an assortment of WATS Lines of various bands. Switching of WATS lines was handled by No. 5 Crossbar offices. And only a few central offices were set up to handle them. If you ordered the service and your office did not have the capability, your WATS line was connected to the nearest office that did. This was included as a part of the service at no cost to you. In Atlanta, the 51 Ivy building and the Buckhead central office building served WATS customers. It is possible that there were other crossbar offices in North Georgia that were set up for it but if not, AT&T would work with the local telephone company to set up the service. For example, if a Gainesville customer ordered WATS, Southern Bell would install the telephone line to the customer's location and AT&T would set up the circuit from the Gainesville central office to the Atlanta central office. The dial tone on the WATS line would come from the Atlanta office. 1966 was the first year that Toll-Free "800" or Inward WATS was offered. You started to see ads for companies wanting you to dial "1-800" to reach them. One of the first well publicized nationwide 800 number was the one for Sheraton Hotels 800-325-3535. They had a catchy jingle to promote it. Like Outward WATS service, Inward WATS lines were set up based on bands. And interstate 800 lines could not receive calls from within the state. Businesses wanting to receive calls from within the state as well as from outside the state had to publish two different 800 numbers. In addition, businesses had to purchase 800 lines with a high enough band to cover all of the states that they expected to receive calls from. As a result of this billing structure, most of the major hotel chains determined that they would save money by placing their central reservations center in the middle of the country. Sheraton's reservations center was put in St. Louis, Missouri. Many other hotel companies chose to put their reservations office in Omaha, Nebraska. 800 calls were routed based on the prefix. 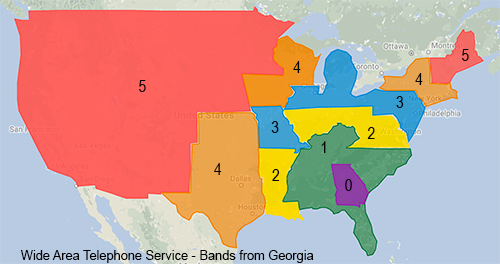 One or more prefixes was assigned to each Area Code in the U.S. and Canada. Based on the prefix that you dialed after "800", the originating 4A toll switching machine would route the call to the 4A machine serving that area. In the 1960s and '70s, toll free numbers terminating in Georgia from out of state had a prefix of "241" and in-state numbers had a prefix of "282". Once the call reached the home area code, the 4A machine there would translate the 800 number into a local 7-digit telephone number. This number terminated in a regular central office line at the customer's location. The local number was used strictly for this purpose and was not the customer's regular telephone number. In November of 1967, Atlanta received its first electronic, computer controlled switching system, The No. 1 Electronic Switching System. The first Number 1 ESS machine had been installed in 1965 in Saccasunna, New Jersey, after nearly 20 years of research and development by Bell Labs. The ESS machine uses a network of glass encapsulated reed relays (ferreeds) to make up its switching network. Two redundant central computer processors control the operation of the system using a stored program. The No. 1 ESS was designed with an ultimate capacity of 65,000 subscriber lines. The machine continuously ran diagnostic programs to identify and isolate trouble conditions. A central control center permitted personnel to monitor the operation of the system. Long Distance billing information (AMA) was recorded on magnetic tape rather than on punched paper tape as it had been done with crossbar systems. ESS also introduced Custom Calling Services, Call Waiting, Three-Way Calling, Call Forwarding, and Speed Dialing. For some reason, this first ESS office did not have coin capability. Coin lines in the area continued to be served by the Step-by-Step equipment and had "87" numbers. When a customer is located in the serving area of central office but is served out of a different office, the arrangement is called Foreign Central Office (FCO). With the introduction of the "892" ESS office, Step-by-Step customers in the "87" office were not allowed to order FCO service to get "892" numbers out of the ESS machine so they could have Touch Tone and Custom Calling features. There was a specific restriction placed on this option in the first few years of the ESS. There was no restriction on a customer ordering a number served out of another office, such as Buckhead or 51 Ivy as long as the customer was willing to pay the monthly mileage charge between the Crescent Avenue office and the chosen serving office. Around 1971, a second ESS machine was installed in the building. Over a weekend, customers with "892" numbers were cut over to the new machine. The new machine had coin control capability and other new features. After the change, coin phones in the area were assigned "892" numbers and served out of the ESS. The original ESS machine that had been installed in 1966 was upgraded and returned to service a year or two later with the code "881". Electronic Switching introduced Custom Calling Services. These services were available at an extra cost of 2 to 4 dollars per month. CALL WAITING Allowed you to place one call on hold while answering a second incoming call. THREE-WAY CALLING Allowed you to place a call on hold in order to add an additional party. SPEED CALLING Allowed you to place calls to frequently used numbers by dialing only one or two digits. CALL FORWARDING Transferred incoming calls to another telephone number. The first version of Call Forwarding used the code *91 plus the "forward-to" number to activate the service and the code *92 to deactivate it. From a rotary telephone, you used the codes 1191 and 1192. This was later changed to 72# and 73#, respectively. The first version of Speed Calling required that you submit your list of telephone numbers to the Business Office. The numbers would then be loaded into the machine for you. This was one of the limitations of the software on the first ESS machines. The second version of the software made it possible for you to set up your speed dialing list yourself. Once Call Forwarding became available with ESS, cheap answering services started to appear. All you had to do was sign up with an answering service company, be given a unique 7 digit telephone number belonging to that company and forward you home or business phone to that number when you wanted your calls to be answered. Sometimes the number that you were assigned was exclusively for you. In that case, the answering service operator would answer with the name of your business and the caller might not know that they hadn't reached your office. Otherwise, you could subscribe to a cheaper service with a generic number to forward your calls to. In that case, the answering service operator would not know whose telephone they were answering unless the caller told them. This could be done without the installation of any lines or special equipment, compared to the answering services that existed before. At this point, there were a few answering machines available but they were expensive so they were not popular. Officially, only the telephone company could provide you with an answering machine and it had to be installed and hardwired to your line. The same day that the ESS office began service, an upgrade was made in the Chamblee Step-by-Step office, adding Common Control equipment. Before the introduction of this equipment, Chamblee customers had the most complicated dialing procedures in the Metro Atlanta area. There were 4 different special access codes required. In 1966, here were the dialing instructions..
With Common Control, a device called a Sender received the customer's dialed digits. The sender then accessed a Translator to look up the correct route. The sender then dialed the correct sequence of digits into the Step-by-Step equipment to put the call through. This eliminated all of the special codes and permitted customers to dial all Atlanta metro numbers by dialing 7 digits, just like in the crossbar offices. The new equipment also made Touch-Tone service available. Common Control for Step-by-Step was not common in The Bell System. We believe it was the only one of its kind in Southern Bell territory. Other telephone companies used it more extensively. It is possible that Southern Bell installed it as a pilot project and intended to install it in other places, depending on how successful it was. But that never happened. Before 1968, you were not permitted to connect equipment of any sort to your telephone line. You could go down to your Radio Shack store and buy a telephone set, but you couldn't legally install it in your house. At this point, all telephones were installed by the telephone company and for the most part, were hard-wired to a connecting block on the wall. So your house would not usually have jacks on the wall to plug into. If you wanted wall jacks and telephones that could be unplugged, you had to order them that way and pay an extra charge for a "portable" telephone with a 4-prong plug. You were charged a monthly charge for each jack and each telephone. Even if you had jacks installed in your house, you did not have permission to plug anything into them other than the company-provided telephone sets. This was part of the "Terms of Service" that existed between the telephone company and the customer. Violation of the rules meant possible disconnection of your service. Many people did violate the rules and installed their own phones. The official reason given for this was that customer-provided equipment could be faulty and cause damage to the company's lines and switching equipment. Another more likely reason was that unauthorized extension phones provided no revenue. Telephone company personnel would test your line periodically to determine whether or not you had unauthorized phones. This involved using a procedure that measured the current used by any telephone ringers connected to the line. When people became aware of this test, they could defeat it by simply disconnecting the ringers on the "illegal" phones. In June of 1968, the FCC made a ruling known as "The Carterfone Decision". This was brought about by a law suit by Carterfone Corporation against Bell Telephone. Carterfone wanted to sell answering machines. Prior to the decision, only the telephone company could provide you with an answering machine. Carterfone and other companies had to produce awkward machines that were attached to your telephone handset with an acoustical coupler. The machine had to "listen" for your phone to ring and then lift the receiver from its cradle. Personal computers were a long way off at this point and were not even envisioned. But there were other data communications devices, such as teleprinters, Teletype machines, and early FAX machines. These also had to be connected to the telephone handset using an acoustical coupler. This practice continued for many years after the 1968 ruling because most telephones did not have jacks to plug equipment into. For several years after the FCC ruling, the telephone company tried to place some controls over the customer-owned equipment. You were now free to connect your own telephones and other devices but you were required to notify the telephone business office of such an attachment. Every device was required to have a "ringer equivalency number" which you gave to the Service Representative. The standard modular telephone jack in use today was not introduced until the mid 1970s. On June 29th, 1968, the Norcross Central Office building was destroyed by fire. After several days, emergency service was provided by manual switchboards installed in trailers. Two weeks later, on July 16th, construction began on a new building. The office reopened on October 26th with No. 5 Crossbar switching equipment. 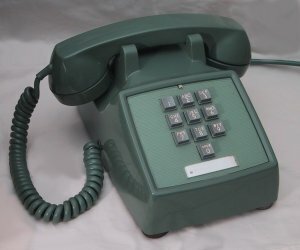 Prior to the mid 1950s, when you dialed an incorrect number or a number that had been disconnected, you reached an operator. But by the time the major number changes of 1955 and 1956 occurred, automated announcement machines had become commonly available. Over the years, the telephone company placed these machines in every central office. The recordings used varied considerably. Some were produced by the telephone company personal working in the central office, with the sound of the switching equipment clacking away in the background. Others were produced centrally and distributed to the different offices. One of these recordings, used in the 1970s, became known as the "Excuse Me" recording and was somewhat humorous. In most cases, after listening to a recording, you could stay on the line and be connected to an Intercept Operator. For some dialed numbers, you would reach the Intercept Operator immediately without first hearing a recording. The Intercept operator answered "Special Operator. The Number You're Dialing, Please!" or "Special Operator. What Number did you dial?". When you gave the operator the number that you dialed, she looked it up on a paper list or maybe a computer printout and gave you the status of the number or the new number if it had been changed. The Automated Intercept system (AIS) replaced the generic recording with a customized message that repeated the number to you and then gave you the new number if the number you called had been changed. An Intercept operator was not needed except in rare cases. The first automated intercept systems used rotating drums containing multiple recorded phrases. A computer or some type of mechanical control system caused the various phrases to be played back in the proper sequence. This had a characteristic sound. The first AIS in Atlanta was built by Audichron Corporation and used the voice of Jane Barbe. Her voice was heard for several years from AIS systems all over the country. Jane is a native of Atlanta. When AIS was installed, ESS and Crossbar offices were able to send the dialed number to the AIS equipment automatically. The Step offices could not do this initially and an AIS operator had to ask the caller what number he dialed. This capability was later added to Step offices that were equipped with ANI after 1973. In November of 1970, during the Thanksgiving Holiday, two more No 1. ESS offices were opened. The larger of the two was the Courtland office in a new building on Courtland Street, downtown. All telephones in the State Capital area were switched to the Courtland office and given new numbers. When the office was placed in service, its territory was completely split off from the main downtown central office. Auburn Avenue and 51 Ivy central offices continued to share a common territory covering most of downtown. But the Courtland Street office territory was separate. This separation only lasted about 5 years. By 1975, the territories were merged and Auburn Avenue, 51 Ivy, and Courtland Street numbers were interchangable. The second new ESS office installed in 1970 was the Indian Creek "292" office on Indian Creek Drive in Clarkston. This office cut over a portion of the territory previously served by the Clarkston "443" office and the Columbia Drive "289" office. It seemed strange that Indian Creek did not simply replace the Clarkston office at that time since it was so close to it. A few years later, Clarkston customers were all transferred to the Indian Creek office away. Centrex was a service introduced in the 1960s for large business customers. Centrex provided a set of features, including direct dialing to individuals and departments, 4-digit dialing between telephones inside the organization, the ability to transfer incoming calls from one telephone to another. It also provided itemized long distance billing for calls dialed by individual users. Centrex used the same terminology as the PBX (Private branch exchange), calling individual telephones "extensions". There were basically two types of Centrex offered. Centrex CO (central office) provided the service, using switching equipment in the central office. Each telephone had its own line to the central office building. Centrex CU (customer unit) was a similar service where there was a PBX installed on the customer's premises. Before 1970, Centrex CO was provided by No. 5 Crossbar equipment. In the Atlanta area, Lockheed had one of these in Marietta and Western Electric had one in Norcross. In 1970, the new Courtland Street ESS office introduced the first ESS Centrex to Atlanta. ESS Centrex was almost entirely a software feature and didn't require much additional hardware at all, compared to No. 5 Crossbar Centrex. Eventually, ESS Centrex was able to offer more features. The first customers of the Courtland ESS Centrex were The State of Georgia government with the code "656" and City of Atlanta Government and Georgia State University sharing the "658" code. Before the Centrex was put in, the state government had separate telephone systems for each agency. Each agency had its own telephone number and receptionist. Individuals could not be dialed directly. The centrex enabled all State departments to dial each other more easily and permitted the sharing of features, such as WATS. A few years after the introduction of ESS Centrex, the trade name ESSX (pronounced essex) was introduced. Around 1970, Southern Bell started to install T-Carrier facilities in the Atlanta area. Carrier facilities are used heavily on trunk circuits in order to carry multiple conversations over a single pair of wires. The T-Carrier was the first widely used carrier system to employ digital encoding. Analog carrier systems up to this point had used modulation techniques similar to those used in radio. This worked well and was used for some local circuits and nearly all long distance circuits. The most commonly used analog carrier systems were able to carry up to 12 voice channels over a single cable pair. T-Carrier expanded this to 24 channels. Analog carrier systems used in local service were somewhat noisy. Using digital encoding with the T-Carrier system eliminated all of this noise. But the first T-Carrier systems injected a noise of their own. They had a fuzzy sound. The T-carrier system was improved in the years following its introduction and the fuzzy quality was eliminated. The system eventually came to be used on nearly all interoffice trunks, including rather short ones. 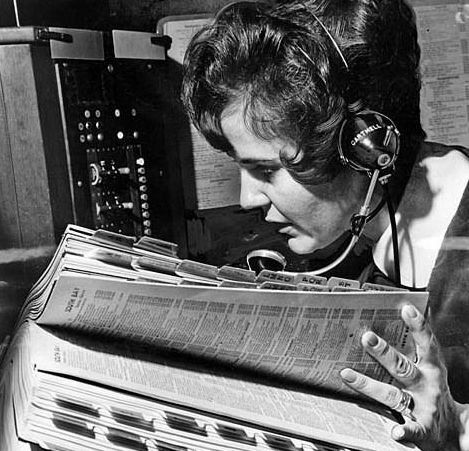 In 1971, a new electronic system began to replace the cord switchboards used by long distance operators. The new system, known as Traffic Service Position System (TSPS), used consoles instead of cord boards. The operator had a numeric display and several groups of pushbuttons. Timing and billing was fully automated. With TSPS, a new type of long distance calling known as "Zero Plus" permitted you to dial person-to-person, credit card, and third number billing calls yourself by dialing "0" plus the area code and number. Before TSPS, you had to dial "0" and give the number to the operator. The TSPS system consisted of an electronic switching unit located in a toll switching center and operator consoles located remotely in other parts of the city. For Atlanta, the first TSPS unit was installed in the Rockdale toll center and connected to the 4A switching machine. Prior to the introduction of TSPS, Atlanta Long Distance operators were all located in the 51 Ivy building, using cord switchboards with direct access to the Atlanta 4A machine. Being able to place the operators remotely from the switching facility gave the telephone company flexibility in locating their workforce. TSPS operator positions were placed in the suburbs in three new buildings in Jonesboro, Mableton, and Norcross. Pay Phone Direct Dialing and "Dial Tone First"
With the introduction of TSPS, you could now dial long distance calls from pay phones using "1+" for station-to-station calls or "0+" for other types of billing. Prior to this, all long distance calls from pay phones had to be placed through the operator and had to be manually ticketed. When pay phones were changed, a large red label reading "WAIT, READ NEW INSTRUCTIONS" was placed on the handset. The new instruction card read "Please Dial all Local and Long Distance Calls". In about a year after pay phone direct dialing was introduced, all pay phones were converted to "Dial-Tone-First" operation. Prior to this change, when you picked up a pay phone, you heard complete silence until you made the initial 10 cent deposit. You had to deposit a dime even to call the operator or make an emergency call. Dial-Tone-First gave you dial tone and permitted dialing without any initial deposit. You only needed a coin to place a local call. Pay phones in Atlanta and in many other cities had telephone numbers in the 9000 series. This was done for a reason. If a customer attempted to place a collect call to a telephone number like 404-524-9901, the operator had to check to be sure that the called number was not a pay phone. Billing a collect call to a public phone booth would have been an easy way to avoid paying the charges. The operator in another city could not assume the number to be a coin phone but a 9000 series number would prompt her to call the "Inward Operator" in the called city and ask for a "Coin check". Starting in 1971 when TSPS was installed, the Step-by-Step offices in the city were switched from using the Crossbar Tandem to the TSPS machine for direct dialed, "1" Plus, calls. At first, the TSPS operators would perform the number identification function, asking you for your number on every call. Within a few years, Step-by-Step offices were upgraded to add Automatic Number Identification (ANI). This identified your number automatically and sent it to the TSPS equipment, eliminating the need for the operator. Prior to the 1980s, nearly all long distance calls were carried over analog trunk circuits. Analog trunks required repeaters placed every few miles. These always had a certain amount of noise or "static". The longer the circuit, the more static you heard. When you called from Atlanta to New York, for example, as soon as the "4A" machine in Atlanta connected you to the trunk to New York, you would hear the static come on. In some cases, a call went through several stages. For example if you called San Francisco and all of the direct trunks were busy, you might get routed through another city, such as Denver. If this happened, you would hear the static come on when you were connected to the Atlanta-Denver trunk. Then the loudness of the static would increase when the Denver center connected that trunk to the Denver-San Francisco Trunk. Overseas circuits were even noisier. In the 1970s, AT&T started using Satellites for long distance service. This was common on calls from Atlanta to the west coast. You could always tell when your call had been switched over the satellite. The background noise would be very quiet. But there would be a very annoying delay between the time you spoke and the person on the other end heard your voice. Then that person answered you and there was an equal delay for their voice coming back to you. The overall affect was that it sounded like the person on the other end was half-asleep, preoccupied with something else, or very rude. Most people didn't know anything about Satellites and had no idea what was happening. As a part of modernization of the network, the 4A toll machines at Rockdale and Downtown were upgraded to an electronic translator system known as ETS. Even with this improvement, by 1973, long distance traffic had increased to the point where these two toll switching machines were at capacity. To provide relief, a third 4A machine was installed in a new building near Smyrna. This office was referred to officially as "Northwest". Atlanta Toll Offices and their "Identifiers" in 1973. Each toll machine and tandem had an identifier code. This identifier was verbally announced at the end of recordings when you dialed an invalid number. In the 1970s, the vast majority of the Long Distance telephone network in North America still relied on the use of the Multi-Frequency signaling system introduced in the late 1940s. With the availability of cheap electronics at Radio Shack and similar stores, people learned to build devices known as "Blue Boxes". These boxes contained simple electronic components and could reproduce Multi-Frequency tones and the 2600 HZ tone that would "reset" a long distance trunk. A 1971 article in Esquire Magazine, Secrets of the Little Blue Box, described the underground network of people who had learned how to build and use these devices. AT&T asserted that it was illegal to use a blue box, because you were stealing services by making long distance calls without creating a billing record. Many of the "phone freaks" were more interested in experimenting and figuring out how to access test circuits, conference lines, and special facilities that could not be reached by dialing the normal way. Some of them even found problems in the telephone network and reported them to the telephone company. News of the Bluebox eventually spread to other people who saw it as a way to make money. So the blue boxes began to be sold on the black market for people to make free calls, including international ones. This finally caused AT&T to become concerned enough to step up their investigations. Several arrests were made. In 1968, two new No. 5 Crossbar central offices were built. One in Lilburn and one in Snellville. These cut over territory from the Tucker, Norcross and Stone Mountain offices. These were late installations of No. 5 Crossbar, considering that several ESS offices had already been installed. We would have expected that all offices installed from this point forward would have been ESS. This was because Western Electric production of ESS equipment was not able to keep up with demand and there were still production plants making crossbar equipment. In 1970, another one was built on the south side in Morrow, cutting over territory from surrounding offices; probably Forest Park, Jonesboro and Stockbridge. In 1972, the Panola Road central office was put into service, taking over parts of the territory that previously belonged to the Lithonia and Columbia Drive offices. The last full sized No. 5 Crossbar in the Atlanta area was installed in Dunwoody in 1973 with the code "394". These last crossbar offices used a new electronic tone plant that sounded similar to ESS. It was a bit different because the tones were mixed with the ringing current, like they were done with the older ringing equipment. In 1976, a small No. 5A Crossbar machine was installed on the south side of Douglasville. The 5A machine was based on the full sized No. 5 Crossbar except that it was designed for small offices . It was modular and available in only two sizes, 960 lines or 1920 lines. It was pre assembled on a platform that could be hauled in one piece on a truck from the Western Electric plant to the installation site. The machine could be wired to local lines and trunks and put in service in a few weeks. The one installed in South Douglasville was in a trailer. In 1976, a second generation processor known as the "No. 1A" was introduced to replace the original No. 1 Processor used in the No. 1 ESS machine. This processor was four to eight times faster than the original processor. When the new processor was used in a No. 1 ESS machine, the machine was known as a No. 1A ESS. The new processor was used in new offices starting in 1976 and was also retrofitted to existing offices over a period of several years. In the same year that the 1A processor was introduced for local switching, the Bell System launched the No. 4 ESS for toll switching. This machine was designed to replace the 4A Crossbar machine. It was different from the No 1. ESS in that it used a fully digital switching network. Atlanta received its first No. 4 ESS machine in 1976. The machine was placed in service in the 51 Ivy building and the original 4A machine from 1952 was retired.